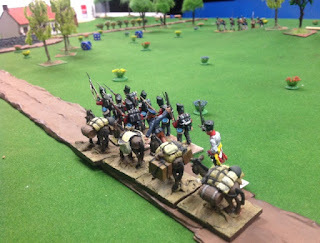 We trotted out the Song of Drums and Shakos rules and my Perry 1/56 figures for some more Napoleonic skirmishing! 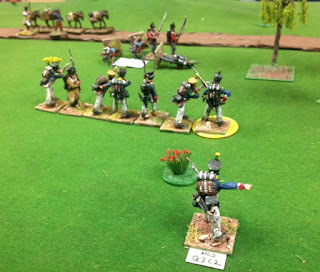 A small British supply train escorted by a column led by an Austrian staff Officer and marching in very smart order is ambushed by a force of sneering Frenchies who were not only chain smoking but wearing their shakos set at jaunty angles! Cyrus sorry I haven't played Sharps Practice so can't compare them. From what I have read Sharps could let you play a bigger game but one of the reasons I've never tried them for up to about 20 -30 figures a side (which I doubt I'd exceed) Song of Drums is great! Okay a quick web search...see the last line...gonna get this fired up quick smartish! ‘61-‘65 is a fast play, Company-level American Civil War game based on the popular Song of Blades mechanics. 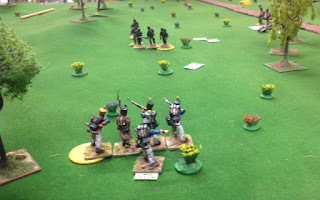 Playable with 40-100 miniatures per side in less than two hours, ‘61-‘65 puts you in command of a Union or Confederate Company, with a Captain and several Lieutenants, Sergeants and Corporals. 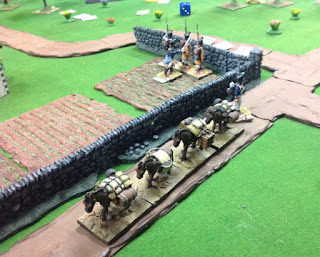 Send your skirmishers ahead, keep a tight formation and – wait to see the white of your enemy’s eyes before firing your volley! I've never seen Open Combat I'll look them up on the weekend, I will use song... for small ACW skirmishes and Smooth and Rifled for larger games.